Previously I have taken you through the Black Bat Cards, Red Bat Cards and Blue Bat Cards as part of my review of some of the most popular Batman cards available. 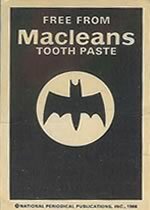 This post will round out the sets of 1966 Batman cards with the Macleans toothpaste and Weeties / Rice Krispies promotional sets. These sets are unlike the Topps produced sets of 1966 in that they were promotional sets given away to buyers of Macleans toothpaste in North America and Weeties or Rice Krispies cereal in Australia. As a result production was considerably lower and tracking down mint copies of these beauties is next to impossible! The card backs differ with the Macleans or Weeties and Rice Krispies logos displayed on a blue background respectively. Additionally there is a final card which celebrates the iconic "Wham! ", "Pow!" and "Bang!" 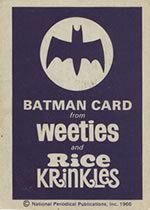 title accompaniments to the 1960's Batman television show. I'm a big fan of these cards! They have the same old school appeal as the other 1966 Batman cards yet come with the additional interesting story and greater rarity. They stand right out in my collection and I am sure they will stand out in yours! As you can see the condition of my cards is not the best. These are 50+ year old cards and seem to have only rarely been kept in mint condition. They do turn up for sale from time to time and don't command too hefty of a price tag unless the condition is superb.